As a cooking option, grilling cannot be beat; if you can cook it, chances are, you can grill it. However, that open flame dancing just under the grill grates requires a slightly different approach than when cooking in the kitchen. For small foods like shrimp, or delicate items like practically every fish, some type of a guard to place over the grill grates makes the process easier. (Not to mention saving foods from falling into the flames.) 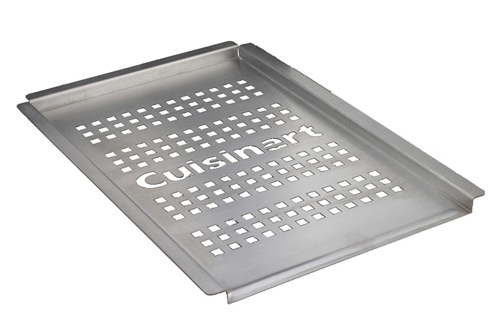 The Cuisinart Stainless-Steel Grilling Platter offers 13-inches by 8-inches of grilling surface, perforated for complete heat penetration. And if you’re a fan of the brand Cuisinart, well it looks like no matter what you happen to be grilling, the one on the middle is yours. Fingers rejoice: Mario Batali to the rescue!